It was a shocking turn of events, both wondrous and devastating; a miracle or a tragedy, depending on how you looked at it. The news came while Nell was relaxing in the Hewitts’ music room, listening to Martin sing his new hymn for his parents. Accompanying him on the gleaming Steinway in the corner was Viola Hewitt in her downstairs Merlin chair, one of four she kept on different floors of the Italianate mansion that overlooked Boston Common from the corner of Tremont and West Streets. August Hewitt lounged in his leather wing chair by the popping fire, arms folded, spectacles low on his nose, his Putnam’s Monthly lying open on crossed legs. Nothing pleased him more on a Sunday afternoon than to bask in the bosom of his family circle in this richly formal room, his favorite. The Oriental-influenced Red Room, a silken refuge visible through an arched doorway flanked by six-foot stone obelisks, was his wife’s preferred sanctuary. Ancestral portraits lined the music room’s rosewood paneled walls, six generations of Hewitt “codfish aristocracy,” most of them in the shipping trade; copper and cloth had gone to China, ice to the West Indies and rum to slave-rich Africa on ships that came back laden with silks, teas, porcelains, sugar, cocoa, tobacco, and the molasses with which to make more rum. But the real merchant prince among the bunch had been Mr. Hewitt’s father, scowling down from above the black marble fireplace, who’d diversified into the textile trade by founding Hewitt Mills and Dye Works, thus greatly augmenting the family fortune. And then, of course, there was August Hewitt himself, represented by his wife’s monumental full length portrait–flanked by modestly draped, life-size statues of Artemis and Athena–who had negotiated a lucrative contract to produce U.S. Army uniforms back when almost no one seriously envisioned a war between the states. His foresight had heaped the family coffers to overflowing. Little Grace, in her favorite apple green frock and pinafore, lay curled up on Nell’s lap, two middle fingers still somehow firmly lodged in a mouth gone lax with sleep. The grosgrain bow adorning the child’s dark hair tickled Nell’s chin, but not unpleasantly. Gracie’s somnolent breathing, the lulling weight of her, her soapy-sweet little-girl scent, all filled Nell with a sense of utter well-being. Across the room, Miss Edna Parrish sat propped up with pillows in her favorite parlor rocker–head back, eyes closed, mouth gaping, archaic mobcap slightly askew–looking for all the world like a strangely withered baby bird. Gracie had climbed out of her nursemaid’s lap at the first wheezy snore and clambered up onto Nell’s, dozing off almost instantly. Through the velvet-swagged windows flanking the fireplace, Nell watched snow float down out of a pewter sky, her book–Miss Ravenel’s Conversion from Secession to Loyalty by Mr. DeForest–neglected in her hand. She loved watching snow lay its glittering blanket over the city–so opaque, so pristine, as if absolving the streets beneath of their years of grime. Boston had been a shock to her upon her arrival here three years ago–so huge, so raucous, a buzzing hive in which she’d felt not just lost but utterly invisible. How she’d longed for the rustic familiarity of Cape Cod–at first. Over time, the city gradually lost its daunting newness and began to feel like home–her home. Just as she became a part of Boston, so she became a part of the Hewitt family. Gracie was the child of her heart, if not her womb, and time had only served to cement her sense of kinship with Viola Hewitt. That kinship notwithstanding, it was rare that Nell joined the family for these Sunday afternoon gatherings, Viola having exempted her from her duties for the better part of every weekend. On Saturdays, she often prowled the Public Library, the Lecture Hall, or–her favorite–the Natural History Museum. There were several other Colonnade Row governesses with whom she’d struck up an acquaintance as their charges played together in the Common, and from time to time they would meet for Saturday luncheon or a lingering afternoon tea–but as Nell had little in common with them, no true friendships ever sprang from these outings. Every Sunday morning, Nell went to early Mass, a too-brief low Mass for which she had to awaken and dress in the predawn gloom, so that she would be free to watch Gracie while Nurse Parrish and the Hewitts attended services at King’s Chapel. After that, she was once more at liberty to go her own way. If the afternoon was mild, she might take a long walk–even in wintertime if the sun was bright–or perhaps settle down with a book on a bench in the Public Garden. When the weather was less agreeable, as today, she often read or drew in her room. She would be there now had Viola not specifically requested her presence today. Gracie is better behaved with you than with Nurse Parrish, Viola had told her, and you know how Mr. Hewitt gets when she starts fussing. He’ll send her to the nursery if she makes so much as a peep, and I so long for her company this afternoon. You’ll be home anyway, because of the weather. Please say you’ll sit with us. Unable to refuse much of anything to Viola, who’d come to hold as dear a place in her heart as her own long-departed mother, Nell had agreed. Mr. Hewitt had cast a swift, jaundiced glance at Gracie when she abandoned Nurse Parrish’s lap for Nell’s, but otherwise ignored her–as he did her governess. Nell tried to recall the last time she and Mr. Hewitt had occupied the same room, and couldn’t. That their paths rarely crossed was due to his distaste for children in general and–from all appearances, although it made little sense–to Gracie in particular. At his insistence, the child took all her meals, with the exception of Christmas and Easter dinners, in the nursery with Nell. On weekdays he put in long hours at his shipping office near the wharves, dined at home with his wife and Martin–Harry almost always ate elsewhere–then spent the remainder of the evening at his club. He came and went on the weekends, as did Nell; on those rare occasions when they passed each other in the hall, they merely nodded and continued on their way. Martin, standing by the piano, regarded his father with a solemn intensity that might be interpreted by someone who didn’t know him well as simple filial deference. At a quick glance, the flaxen-haired, smooth-skinned Martin looked younger than his twenty-one years; it was those eyes, and the depth of discernment in them, that lent him the aspect of an older, wiser man. His mother closed the piano softly, not looking at either her husband or her youngest son. From the front of the house came two thwacks of the door knocker. Nell heard Hodges’s purposefully hushed footsteps traverse the considerable length of the marble-floored center hall; a faint squeak of hinges; low male voices. Long seconds passed, with Martin studying his father in that quietly grave way of his. “Thank you, sir. I’ll give it some thought.” His gaze flicked almost imperceptibly toward Nell. Just as August Hewitt looked to have been chiseled from translucent white alabaster, his friend Leo Thorpe could have been molded out of a great lump of pinkish clay. Florid and thickset, with snowy, well-oiled hair, his usual greeting was a jovial “How the devil are you?” Not today. Mr. Thorpe dismissed the sleeping nursemaid with a fleeting glance before turning his attention to Nell. Rather than rising from her chair, and thereby waking Gracie, she simply cast her gaze toward her open book, as if too absorbed in it to take much note of anything else. He hesitated, then looked away: the governess tucked back in the corner with her sleeping charge. Nell didn’t mind, having become adept not so much at mingling with Brahmin society as dissolving into it. Dr. Greaves was right: It could work to one’s advantage for people to forget you were there. The formal calls and luncheons to which she often accompanied Viola Hewitt, with or without Gracie–Mrs. Bouchard having little tolerance for them and Viola needing help getting about–afforded, despite their tedium, the most remarkable revelations. Nell had innumerable sketches upstairs of fashionably dressed ladies and gentlemen whispering together over their fans, their champagne flutes, their tea cups. They hardly ever whispered as softly as they should. Viola’s smile was of the long-suffering but taking-it-well variety. “You can talk in front of me, Leo. What mischief has Harry gotten himself into this time?” As August Hewitt’s longtime confidant and personal attorney, Leo Thorpe had been most accommodating, over the years, in sweeping the worst of Harry’s libertine excesses under the carpet. Mr. Thorpe was also, as of the last city election, a member of Boston’s Board of Alderman, and thus responsible, along with the mayor and members of the Common Council, for all facets of the municipal government. “It’s not about Harry.” Rubbing the back of his neck, Mr. Thorpe informed his hostess that he would perhaps, after all, appreciate a nice, stiff whiskey. “Absurd.” Her husband banished the notion with a wave of his hand. “I couldn’t imagine it,” the alderman agreed. “We only have the two sons, Thorpe,” Hewitt said. His wife fingered the primitive turquoise necklace half-buried in the froth of blond lace at her throat, her mouth set in a bleak line. Thorpe looked toward the doorway as if hoping the drinks tray had materialized there. “If it wasn’t Martin or Harry…” Hewitt persisted. “Touchette?” Viola sat up straight. Her French pronunciation was a good deal better than Mr. Thorpe’s. She looked away when her husband cast her a quizzical glance. The Hewitts gaped at him. Dennis, one of the Hewitts’ two handsome young blue-liveried footmen, came with the drinks, which he offered, unsurprisingly, to everyone but Nell. Had Viola noticed, she would have said something, as she invariably did when Nell was slighted by one of the staff. Governesses, because they were often treated more like family members than employees, tended to draw the wrath of a household’s domestic staff; but at least most of them had been born into privilege and were therefore nominally deserving of a show of respect. Not so with Nell, who was widely scorned by servants with similar working class backgrounds who regarded themselves as her equals–or, in some cases, her betters–and resented having to serve her. Particularly disdainful were Mrs. Mott, Dennis, Mr. Hewitt’s valet and most of the maids–especially the sullen Mary Agnes. “Certainly–just to make it official. He wouldn’t answer, but I knew it was him. He’s a surgeon, yes?” Thorpe reached into his coat for something swathed in a handkerchief. Unwrapping it, he revealed a strip of tortoiseshell with a crack in it. Viola sucked in a breath as he unfolded from the object a slender, curved blade stained with something dark. Nell craned her neck slightly for a better view. Thorpe turned and blinked at her. She scolded herself for calling attention to her presence, but the damage was done. “Bistouries are surgical knives that are quite narrow,” she explained, “and sometimes curved, like that one. And very sharp at the tip.” Gracie stirred, but settled back down when Nell rubbed her back. “A pocket surgery kit?” Thorpe said. Color leeched from her face. Her husband sat back, slid off his spectacles, rubbed the bridge of his nose. “Viola…” Her husband rose and went to her. Nell stared, dumbfounded. Never in the three years she’d known Viola Hewitt had she seen her lose her composure, even for a moment. “Just trust me, Viola. Thorpe.” Hewitt motioned his friend to follow as he left the room. “Ma’am…” Nell looked from the sleeping child in her arms toward the ceiling, where footsteps squeaked; the library was directly overhead, right off the second floor landing. “Mrs. Hewitt, your husband will dismiss me for sure if he catches me.” He’d sacked employees for far less. Gracie mewed like a vexed kitten when Nell rose and carried her across the room. “No…” the child griped sleepily, no doubt assuming she was being taken upstairs to finish her nap in the nursery. “Want Miseeney.” She jammed those two fingers in her mouth, eyes half-closed, pinkened right cheek imprinted from the double row of tiny covered buttons on Nell’s bodice. Nell stole upstairs as quietly as she could, thankful for the carpeted stairs and the plush Aubusson on the landing. Muffled voices grew louder as she neared the closed library door, where she paused, sketched a swift sign of the cross. Please, St. Dismas, please, please, please don’t let him open that door and find me lurking here. Funny how she still directed her prayers to the patron saint of thieves, after all these years. “He could hang for this, you know.” Leo Thorpe. “Has he been arraigned yet?” asked Hewitt. This was the first time Nell had ever heard coarse language spoken in this house. She would not have expected it from the rigidly proper August Hewitt, even with no ladies present. “What address did he give?” Hewitt asked. 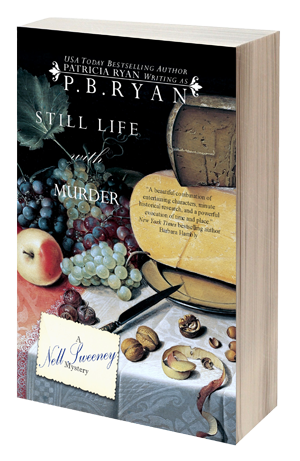 In the ensuing silence, Nell perused the paintings hung close together on the darkly paneled walls–Mrs. Hewitt’s portraits of her family, bordered in ornate gilt frames. Here on the landing there was one of her husband with his three younger sons and several of those sons posing separately and in pairs. Achingly handsome men, in particular the late Robbie, with his thick, gilded hair and dramatic black eyebrows. Around the corner, in the corridor leading to the family bedrooms, were many more of her paintings, most of the Hewitt scions ranging in age from infancy through their twenties. Notably absent from the collection was any depiction of their eldest son. All Nell really knew about William Hewitt was that he’d been schooled, from early childhood, in Great Britain. “Damn fine cigar,” Thorpe muttered. Even through the door, Nell heard Thorpe’s deep sigh. Nell whirled around, her heart kicking. “Master Martin.” He’d come around the corner, evidently on his way downstairs. “I was just looking at your mother’s paintings,” she said as she walked past him, into the corridor proper, so as not to be heard by the men in the library. “Father doesn’t like to hear his name–even now that he’s gone. I find it hard to understand. I mean, he can’t have been any worse than Harry, and Harry’s always in one fix or another–either it’s his drinking, or his gambling, or his…” Martin looked away, clearly discomfited. “I wasn’t… We weren’t…” Even in the dimly lit corridor, Nell could see Martin’s ears flare crimson. Her fault? Did she knife that man outside Flynn’s boardinghouse? Did she tell Alderman Thorpe to bury her son “as deep as you can get him” in the Charles Street Jail? There were people responsible for begetting this situation and making it worse, but it seemed to Nell that Viola Hewitt was as blameless a victim of it as Ernest Tulley. Heedless of the tear stains dotting the letter, Viola folded it and tucked it into an envelope, on which she wrote, in her signature violet ink, Dr. William Hewitt before drawing up short. She jammed the pen back in the crystal inkwell, tore the envelope away and replaced it with a fresh one, which she addressed to Mr. William Touchette. She heated a stick of violet sealing wax in the flame of her desktop candle, melted it into a tiny silver spoon, dripped the molten wax onto the envelope’s flap and imprinted it with her monogrammed insignia. “You must take this to Will,” she told Nell. “What?” Nell exclaimed as her employer shoved the letter in her hand. It was a good lie; Nell was grudgingly impressed. But what if it didn’t work? Going behind August Hewitt’s back this way was far worse than eavesdropping at his library door. She’d never heard him sound so furious–or determined. If he found out what she’d done, he would fire her, and Viola would be helpless to prevent it. No one defied August Hewitt and got away with it, ever. A flurry of nonsense babbling drew Nell’s attention to the bedroom, where Gracie was gamboling in circles, arms outstretched, an ostrich-plumed bonnet jammed low over her face. Paola–Nell’s only real friend on the Hewitts’ staff–caught Nell’s eye and smiled. A darkly beautiful woman about Viola’s age, although she looked much younger, Paola was known as “Miss Gabrielli” despite being married–assuming her husband was still alive, for she hadn’t been back to Italy in the thirty or so years she’d served as Viola’s lady’s maid. By the same token, tradition regarding housekeepers dictated that Evelyn Mott, a spinster, be addressed as “Mrs. Mott.” None of it made much sense to Nell, but she’d long ago stopped trying to understand Brahmin customs. “I can’t leave,” Nell said. “Who’ll keep an eye on Gracie?” She was a child who got into everything and needed frequent running after, which was why Viola was unequal to the task. Nell pressed the heel of her hand to her forehead, feeling trapped and woozy and increasingly resigned. If not for Viola Hewitt, she would still be in East Falmouth, wearing frayed cast-offs as she tended round-the-clock to Cyril Greaves’s every need. Not that she’d begrudged him any of it, God knew. She’d been fond of Dr. Greaves, very much so. He’d quite literally saved her life–only to remake her into the kind of woman who could function in a world of glittering privilege. He’d let her go regretfully, but with a measure of grace that had touched Nell deeply, because she’d known he was doing it for her. For all that, she would be eternally grateful; but she was grateful to Viola Hewitt as well, exceedingly so, for having invited her into this world–and for giving her Gracie, the only child she would ever have. “A lady to see you, Touchette,” announced the pockmarked guard through the iron-barred door of the holding cell. “I don’t know any ladies.” The voice from within–drowsy-deep, British-accented and vaguely bored–did not belong here. It was a voice meant for the opera box, the ballroom, the polo field…not this fetid little police station cage. Nell’s view of William Hewitt was limited by her position against the wall of the cramped visitor’s alcove and the fact that it was only the cell’s door that was comprised of open grillwork; the walls were solid brick. From her angle, all she could make out through the barred door were two long legs in fawn trousers, right ankle propped on left knee. A hand appeared and struck a match against the sole of a well-made black shoe. The hand was long-fingered, capable–a deft hand with a scalpel, she would guess. Nell clutched to her chest the scratchy woolen blanket and Bible she’d brought. She hated this. She hated being in this monstrous brick box of a building, surrounded by blue-uniformed cops who all seemed to stare at her as if they knew who she really was and why this was the last place she should be. She hated the way Gracie had cried and reached for her, squirming in Paola’s arms, as she’d put on her coat to come here. And she really hated having to confront this man who may or may not have cut another man’s throat last night in a delirium born of opium–or lunacy. “You can give him them things, ma’am, but I’ll have to check ’em first.” The guard held his hand out. “The blanket, then the Bible.” He unfolded and shook out the former, fanned the pages of the latter, and handed them back. Matches? Nell thought about the flammable crinoline shaping her skirt, and the newspaper stories of women burned alive when their dresses brushed candles or gas jets. She stood motionless after the guard left, listening to the receding jangle of his keys as he returned to his station at the far end of the hall. With a steadying breath, Nell stepped away from the wall and approached the door to the cell, staying a few feet back, as the guard had advised. Its occupant was standing now, his weight resting on one hip, drawing on a cigarette as he watched her come into view. He was tall, somewhat over six feet, with hair falling like haphazard strokes of black ink into indolent eyes. His left eyelid was swollen and discolored, with a crusted-over cut at the outer edge. Two more contusions stained his beard-darkened jaw on that side, and his lower lip was split. They interrogated him at some length last night. Even unshaved and unshorn, his face badly beaten, there could be no mistaking that this man was Viola Hewitt’s son. It wasn’t just his coloring–the black hair and fair skin–but his height, his bearing, the patrician planes and hollows of his face. His gaze swept over her from top to bottom as he exhaled a plume of smoke, but it felt different than when Harry did it. With Harry there was always a speculative glimmer behind the roguish audacity in his eyes, a spark of real heat that he could never fully disguise. The eyes of the man assessing her at the moment betrayed no such illicit interest. He took her measure as indifferently as if she were a mannequin in a shop window. Nell felt like a mannequin sometimes, or a doll, given Viola Hewitt’s enthusiasm for dressing her. I’m too old and too crippled to wear the newest styles, she would tell Nell, so you must wear them for me. The dresses she ordered were always of the latest Paris fashion, but discreet in cut and color, as befitted a governess–no stripes or plaids, no swags, ruffles, bows, or rosettes, no feathered hats. Today’s costume was typical: a gunmetal day dress with the sleek new “princess” skirt and a small, front-tilted black hat. The only jewelry she wore on a regular basis was the pretty little gold pendant watch Viola had given her their first Christmas together. Just this morning, Viola has praised her “restrained elegance.” Nell didn’t think she would ever understand how rich people could interpret such dreariness as elegant. As for William Hewitt, he might have passed for something akin to elegant this time yesterday, but now… He was in his shirtsleeves; moreover, his shirt was flecked near the top with reddish-dark stains–whether his own blood or Ernest Tulley’s, she had no way of knowing. His collar and tie were both missing, giving him a decidedly disreputable air. Adding to the effect was the cigarette, which Nell had never seen a man of his station smoke, although she’d heard they were catching on in certain fast circles. He came toward her, hand outstretched. She stumbled back, dropping the Bible and knocking over the bench. He looked at her through the bars, not smiling exactly, although there was a hint of something in his eyes that might have been amusement. Idiot! Nell berated herself. She knew not to show fear around dangerous men. A man with the predatory instinct was like a wolf; if he sensed your weakness, you were done for. It was a hard lesson, but one she’d learned well. She was out of practice, that was it; too much soft living among civilized people. “Of course. I… Here.” Swallowing her trepidation, she stepped just close enough to push the blanket through the bars. The unbuttoned cuffs of his sleeves, which should have been white, were stiff and brown, as if encrusted with mud; but of course it wasn’t mud. He took the blanket, shook it out and draped it over his shoulders, chafing his arms through it–curious, since it was quite warm in here, thanks to a wood stove out in the hall. “Good day, Miss Chapel.” He turned his back to her in brusque dismissal. “Trust me when I assure you that any time spent praying over me would be quite wasted.” He crossed with a slight limp to the cot he’d been sitting on before, one of two against opposite walls of the windowless cell. Both mattresses were sunken and lumpy, their ticking soiled with a constellation of stains that didn’t bear thinking about. There was no pillow, no furniture–just an empty stone-China chamber pot in one corner and a tin bowl of gruel studded with cigarette butts in the other. He flung his cigarette into the gruel and sat again, stiffly. Tucking the blanket around him, he leaned back against the wall, yawned and closed his eyes. “I didn’t come here to pray over you, Dr. Hewitt,” Nell said. If he had any reaction to her use of his real name, he kept it to himself. “Your mother sent me,” she said. He opened his eyes, but didn’t look at her. “Go away, Miss Chapel.” He shut his eyes again. “Adopted?” He sat up, staring at her. A bitter gust of laughter degenerated into a coughing fit. “Haven’t they ruined enough sons?” he managed as he fumbled inside his coat. He bundled himself in the blanket again and leaned back against the wall, coughing tiredly as he puffed on the cigarette, his face sheened with perspiration. “Are you sick?” Nell asked. Rattled by his vehemence–and by the blasphemy, which her ears were unused to of late–Nell turned and busied herself righting the bench. She sat, smoothing her skirts just to have something to do with her hands. “A day laborer, was he?” The lowest of the low, taking whatever job was available for whatever pittance was offered. “That’s right,” Nell answered with a carefully neutral expression. “You’ve no idea.” Nell had the disquieting sense, as he questioned her, that he was slipping an exploratory scalpel into her mind, her memories, her very self–a dangerous proposition, given what he might unearth if he ventured deeply enough. Too much was at stake–far too much–for her to permit that. “Must you keep turning the conversation back to me?” she asked. “Still using the violet ink, I see.” Turning the envelope over, he rubbed his thumb across the dab of sealing wax. “She always did like to do things handsomely.” He crushed the letter in his fist and tossed it into the chamber pot. Uncoiling from the cot, he closed the distance between them with one long stride, the blanket slipping to the floor. Tempted to back away, Nell held her ground, hands fisted around the bars, not flinching from his gaze. For a moment he just stared down at her with his bloodied shirt and battered face, eyes seething, a hard thrust to his jaw. Reaching inside his coat, he produced a match, which he scraped across one of the iron bars; it flamed with a crackling hiss. “You were told to keep your distance,” he said softly.